How to get the status of an importer in Equatorial Guinea? How to get import licence in Equatorial Guinea? 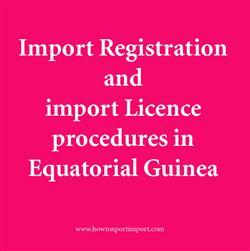 What are the procedures for registration as an importer in Equatorial Guinea? How to start an import business in Equatorial Guinea? What are the certification formalities to import to Equatorial Guinea? This post explains about import registration procedures to be obtained from Equatorial Guinea government authority for importation to Equatorial Guinea. Any natural or legal person who wishes to import into Equatorial Guinea can do so. But according to products nature, certain goods for import may be subject to an authorization, license, rules of quality or packaging, standardization or special formalities. For commercial purpose, a registered trade with concerned license (if required) as per the business and have enlisted in the Trade and Company Register of the country is must for exporting and importing of products from and to Equatorial Guinea. This information is about import licensing procedures to import goods to Equatorial Guinea. If you have to add more information about import permit and registration required to import goods to Equatorial Guinea, share below your thoughts.